Prior to 1984, India has been an active participant in conducting experiments in space sciences for more than three decades. India had sent Mr. Rakesh Sharma, Squadron Leader in Indian Air Force into space through the Russian spacecraft Soyuz T-11 from the Russian cosmodrome Baikonur, presently in Kazakhstan. 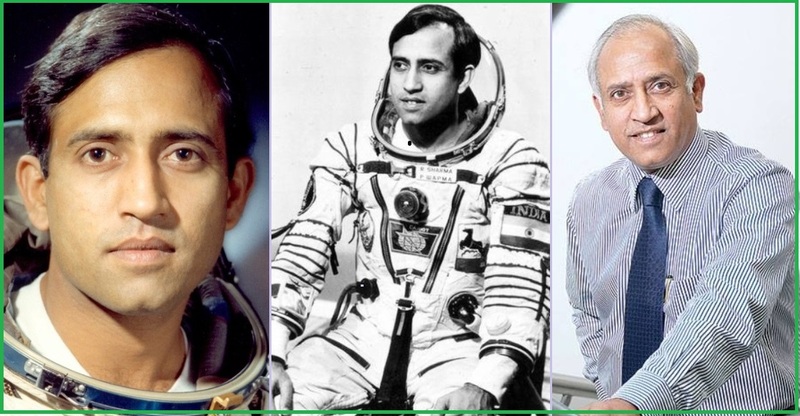 Rakesh Sharma was the first Indian to travel in space who enhanced the international prestige of India as a nation with a paramount potential in space experiments. Rakesh Sharma flew into space as a part of joint space programme between Indian Space Research Organisation (ISRO) and the Soviet Intercosmos space programme. He was chosen out of hundreds of aspirants to undergo training along with the Soviet cosmonauts. He is said to have followed the prescribed diet regime initially and abandoned it subsequently to practise his traditional physical exercise Yoga to keep himself fit for adapting to zero gravity conditions and also to study various biological changes on human body during space flight. The Russian spacecraft Soyuz T-11 carried three crew members Yury Malyshev (Russian Commander), Gennady Strekalov (Russian Flight Engineer) and Rakesh Sharma (Research Cosmonaut). The Soyuz T-11 lifted off into space on 2nd April, 1984 from the Baikonur cosmodrome. On docking with the Soviet space station Salyut-7, the crew members stayed aboard for about eight days and conducted 43 experimental sessions. The experimental work of Rakesh Sharma was mainly related to bio-medicine and remote sensing. Rakesh Sharma’s work was specifically focussed on earth observation programme with particular reference to India and silicium (silicon) fusion tests. In addition to environmental studies, photography and investigations into space materials technology, a special emphasis was laid by the crew on study of physiological changes in human system under microgravity. The medical studies focussed on cardiac systolic (contraction of heart) effects and magnitude/spatial distribution of systolic energy in vascular system; this study was known as “Ballisto” experiment. This has provided important diagnostic information on the systolic function of the heart and the process of vibratory energy conversion during circulation of blood. The crew had also conducted the experiment called “Vector” to study the biometrical activity of heart under micro/zero-gravity. Apart from practising yoga during pre-launch period, Rakesh Sharma performed yoga exercises every day of the space flight. It was really much harder to perform such feats under the conditions of weightlessness because cosmonauts undergo floating movements during their odyssey. In order to prevent himself being swayed astray, he had to find rigid point of support and strapped himself to the space station’s gym apparatus in order to regulate careening and haphazard floating movements. The bio mechanical effects in the muscles of shin, back and hip in various postures while performing asanas in yogic exercises were recorded by special gadgets. The results of the experiments conducted by the crew members proved to be of great scientific value in medical research. Equally fascinating experiments were performed by the crew members under the space materials technology programme. The research tests called “Overcooling experiments” were conducted to study the phenomenon of extremely rapid cooling for solidification of metals in molten state and to ascertain the specific conditions required under microgravity to obtain the special forms of metallic materials, called “metal glasses” which are resistant to radiation, high temperatures and severe media of heat. Indian scientists were of the opinion that outer space is a more suitable environment to conduct study on glass metals like silver-germanium alloy. The experimental results by the crew members were of great help for scientists to explore the possibility of commercial production of the weird substances that can be used in several industrial applications. Normally solid metals are categorized as crystalline because they possess a highly ordered arrangement of atoms and are good conductors of electricity. Ordinary glass materials like window glass are impervious insulators since atoms are arranged in disarray as in the case of amorphous substances. But, on the contrary, the metal glasses or amorphous metals are found to have a higher degree of electrical conductivity. Different methods of producing amorphous metals include accelerated rapid cooling, physical vapour deposition (a sort of reverse process of sublimation), solid state reaction, ion irradiation and mechanical alloying. In the process of accelerated rapid cooling, the substances are solidified at a rate of million degrees of Celsius per second when the rate of cooling is too fast for crystals to form orderly structures and the atoms are locked off like in a glassy state. Of late, amorphous metals with thickness of one millimeter have been produced by superfast rapid cooling techniques. The amorphous substances thus produced are called BMG (Bulk Metallic Glasses) and are found to be three times more tensile and stronger than ordinary steel. The spacecraft Soyuz T-11 consisted of three components – the Orbital module, the Descent Module and the Instrumentation/Propulsion module. The three cosmonauts were in the middle segment the Descent Module. On return journey, the Orbital module and the Instrumentation/Propulsion module were to burn off in the earth atmosphere, on being evicted. The total mass of the spacecraft was drastically reduced by two-thirds and it became all the more necessary to control the speed of Descent module when it reached the Entry Interphase. The region of Entry Interphase was 121.9 kilometers above the earth, when the progressively thickening atmosphere would begin to heat the outer surface of the Descent Module. From the point of Entry Interphase, the speed of the module was high enough to bring the spacecraft to the land within 23 minutes. Eight minutes later, the module was zipping through the earth atmosphere at a velocity of 230 meters per second (828 kilometers per hour). The module was equipped with four parachutes which were to swing into operation in different stages. Two pilot parachutes were unfurled initially and third parachute (drogue) got attached itself to the second one in a few seconds. The drogue was able to retard the speed of the spacecraft to 80 meters per second (288 kilometers per hour). The last and the major parachute finally unfolded to slow down the speed to 7.3 meters per second (26 kilometers per hour) which was still too fast for a comfortable landing. Two sets of three small engines at the bottom of the spacecraft were fired for a safer touchdown. You can read Rakesh Sharma Biography in our previous post Indian Space Hero. The space mission had the stand-by crew team consisting of Anatoli Berezovoy (Commander of Soviet Union), George Grechko (Flight Engineer of Soviet Union) and Ravish Malhotra (Research Cosmonaut of India). Rakesh Sharma was eventually honoured with the award “Hero of the Soviet Union” by the erstwhile USSR. He was also felicitated along with his co-cosmonauts/ the other two Soviet members of the mission with the “Ashok Chakra”, the highest gallantry award (during peacetime). India has been contemplating to conduct manned space missions for the last few decades. Keeping in mind the disaster of Columbia space shuttle in 2003, space engineers are more concerned about developing a space capsule which can be jettisoned safely by the occupant crew members, well before the predicted explosion of the spacecraft. The forthcoming manned space mission of India, Gaganyaan is likely to be launched in December 2021. Gaganyaan will be a spacecraft equipped with space capsule which can accommodate three crew members. On experimental basis, a space capsule built by HAL was tested successfully on 18th December 2014.